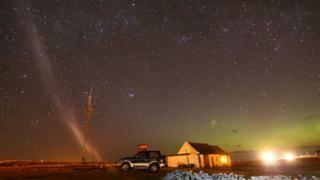 A mysterious phenomenon dubbed Steve has been spotted by stargazers in Scotland. More properly described as a Strong Thermal Emission Velocity Enhancement, it was seen during displays of the Aurora Borealis overnight. Astronomers are trying to better understand the phenomenon, and Nasa is funding a citizen science project seeking sighting of the aurora. It was seen from the isles of Skye and Lewis. Star-gazers have also reported seeing Steve from near Oban in Argyll and Gairloch in Wester Ross. The Aurora Borealis, also known as the Northern Lights, were seen more widely, including from Shetland, Caithness and Aberdeenshire. 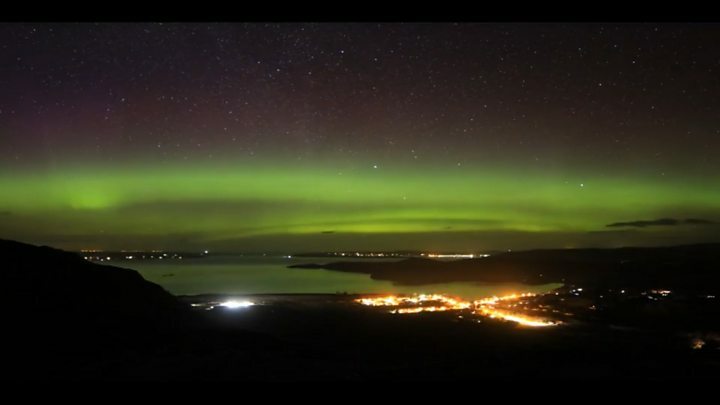 Media captionStargazers have been enjoying views of the Aurora Borealis across parts of Scotland. Nasa describes Steve as as a very narrow arc, aligned east-west, and extending for hundreds or thousands of miles. It mostly emits light in purple hues and can last for up to an hour, sometimes accompanied by "a rapidly evolving green picket fence-like" aurora. The name Steve is in homage to a 2006 children's film Over the Hedge, where the characters give the name to a creature they have not seen before.